Click on link above for trail log. New maps of this trail are available at the Ranger District Office in Estacada. The north end of this trail appears to have been abandoned by the Forest service, which is unfortunate since it removes access to Mt Lowe, which is a great viewpoint. It no longer appears on their trail inventory. The official start of this trail is at Graham Pass. The north end of the trail is still very accessible and an interesting trip. Care must be taken when hiking any abandoned trail, however. Trail runs the length of Rhododendron Ridge with some road walking through heavily logged but quite scenic and interesting area. Connects with Burnt Granite Trail 595, Rho Creek Trail 569, Mt. Lowe Trail 562, and Hawk Mountain Trail 564-A. 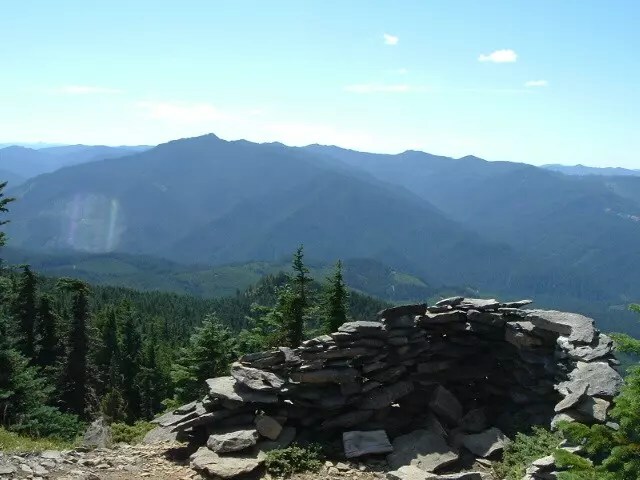 This was part of the Oregon Skyline Trail in the 50s and 60s. This is a very nice under appreciated trail. Volunteers have been steadily restoring and improving this neglected trail for several years now. The district map is close but not reliable at this time. The trail is fairly well signed from Cachebox Meadow north to the 6310 Road — about eleven and a quarter miles. The primary trailheads are at the 6310 Road north of Mount Lowe, at Graham Pass, and at Cachebox Meadow. There are many other access points. Much of the route is heavily wooded and remote in spite of roads. The clearcuts offer views on the south end of the trail. The better alpine settings and views are in the Mount Lowe vicinity. Hawk Mountain is an interesting site and a nice place to camp. The meadows are small but interesting. Botanical interest in places. Water is not available for the most part. There is a spring box beside the trail just south of Round Meadow but it should not be relied upon. There can be water at Fawn Meadow into late Summer. Round Creek dries out by August. As with most trails along divides, this is a moderately level trail. Trail is blazed for the most part. The grades are easy. The clearcuts through which the trail does pass offer huckleberries starting in August. Road crossings and trailheads are marked with yellow diamonds. A good area to spend a couple days exploring. The 4670 Road is the easiest way to get up to the trail. It’s a long drive regardless. Hiked the south end of this trail (to Hawk Mountain) on 10/9/2017 – the trail from the 6355 road to the junction with the lookout trail (564-A), was completely free of downed logs and in great shape. It looked like it might have gotten a little brushier past the junction – I’m guessing most people use this to get to the cabin, so that 2 miles of trail gets a lot more use than the rest of it.